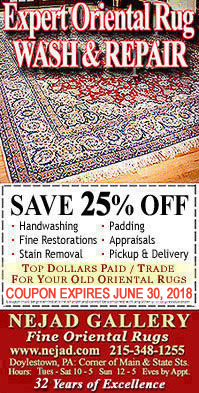 For over 33 years, Nejad has been the tri states area’s most trusted name in oriental rug cleaning and repair. As designers and manufacturers of handmade rugs, Nejad has a unique understanding of every facet of rug production as well as rug care and maintenance. In order to preserve and protect your oriental rugs we recommend that you have your rugs professionally cleaned every 5 years. At Nejad we use the best centuries old techniques - including the Dasthour method of hand washing and air drying. Every rug is carefully inspected for stains, wear patterns and restoration needs. We do not send rugs to other cleaners who often use industrial cleaning machines and harsh chemicals - we clean all of our rugs in our own facilities in a carefully controlled environment. "I'm calling to thank you so much for doing such a good job on a very difficult rug! I really appreciate all your effort and your work and it looks terrific and I'm so happy to have it back - and so I wanted you to know how much I appreciate everything you did. We service flood and water damaged rugs and have over 33 years of experience working with insurance companies and public adjusters. * We do appraisals of antique and older rugs and carpets.